I think I might have found a new favorite time to fly. I left work on time today, which was nice change from the average day. Since I work close to the airport I was airborne a little after 5:30. I was going to be flying South East from Blue Ash, taking me over Interstate 275, the bypass around Cincinnati. It was fun cruising along at 115 knots looking down at the cars stuck in the evening commute home at the end of the business day. 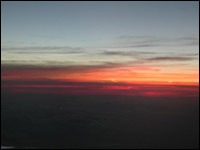 What made the flight even more perfect was the beautiful pink sunset that was taking place out my right side window. Many pilots warn of the dangers of flying at night, that it is easier to get disoriented or that if you have engine problems the chances of spotting a safe landing area is more difficult. I personally love taking off just before sunset and enjoying the sunset from the sky then flying for a while in the evening sky before landing to the lights of the airport. I have not yet flown during a sunrise but I imagine only it can compare to the beauty of a flight by sunset.